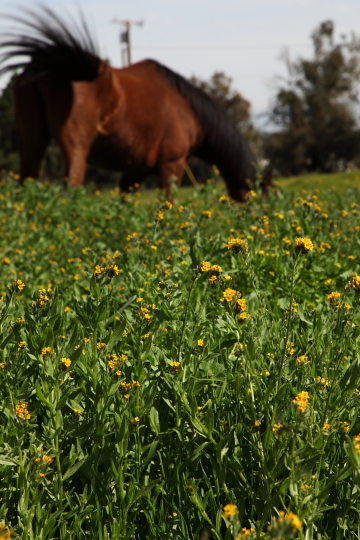 This week’s photo is a shot I took at Hart Ranch this past weekend. I was testing out the features on the new camera and I thought this was the perfect place for that. I walked around the ranch in the middle of the afternoon and got to take many random horse photos. One horse in particular was outside of it’s pen and roaming freely around the facility. I decided to stalk the scraggly bay gelding while he grazed in a field of wild flowers. This particular shot was my attempt at being artistic, also I was experimenting with the depth of field. I love the color of the flowers in this photo. I also really like the horse being out of focus in the background and his tail flipping while I took the shot. I only added a little saturation to make the flowers pop out more. Photo Info: Taken with my 5D Mark II at F11 and 1/250 of a second; ISO 100.